Nikki Jutras is our winner for repinning our Peachy Keen skirt! with your size preference and shipping address! It’s finally here! Our Peachy Keen Collection will be available at taylorjoelle.com this week! To celebrate the launch of the collection, we’re having another Pinterest contest! Want to win an item from the Peachy Keen Collection? All you have to do is REPIN IT TO WIN IT! 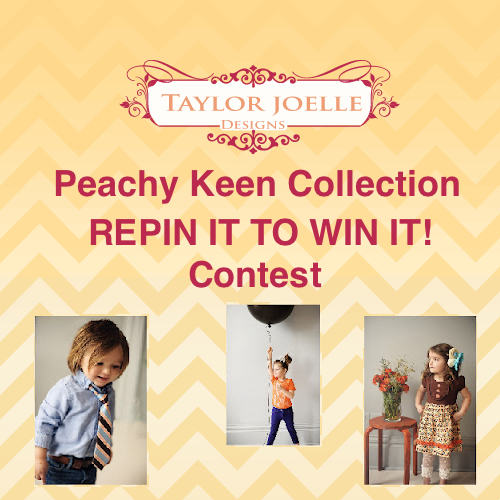 1) Visit the Pinterest Board “Peachy Keen Collection – REPIN IT TO WIN IT CONTEST“. 2) Repin your favorite item from the collection. You can repin as many items as you would like. Each repin will count as 1 entry into the contest. The repin must be a direct repin from a pin on our contest board to count for entry. 3) You will have until Mon 4/16/12 at 11:59pm MST to repin as many items as you would like for entries into the contest. Repins after this time will not be counted. 4) On Tues 4/17/12 we will choose a random repin (using random.org) as the winner of the contest. The winner will WIN THE ITEM THAT THEY REPINNED! 5) We will announce the winner at the top of this blog post on 4/17/12 and will link it to Facebook, Pinterest, Twitter and Google+. The winner will have 48 hours to claim their prize by emailing brooke@taylorjoelleblog.com or a new winner will be chosen. We will not be emailing the winner as we will not have a way to collect the email addresses from repins. You must check back to this post on 4/17/12 to see if you were the winner.